Have you found your new groove yet? I’ve got to admit I am amazed—and grateful—at how quickly our family shifted into a new fall routine. Our oldest son returned to public school after being homeschooled for several seasons, but we’re still homeschooling our younger two. I wasn’t sure of what to expect. All I knew was we were going to be busier than usual and going several directions. And we are! That makes family mealtimes together even more important. 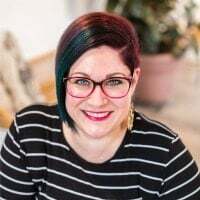 What has worked for us so far is routines for have-to-do daily activities, but planning for open-ended time so nobody feels like an automated robot. For our youngest two, picture/word charts on the fridge help them remember their responsibilities so they don’t need too many verbal reminders—just praises and smiley faces for jobs well done. Since Jorryn was so pumped to attend middle school with his friends, he really has become a self-starter. It’s amazing. My son, who used to be the morning sleepy-head, starts the day early, with no complaints. And his day is full. In addition to classes and homework, he is playing football, continuing drum lessons and he has just begun playing the oboe (yea for him; boo for my ears!). Daily family time really matters to us. It does take some juggling but we’re making it happen at least one meal a day. Since all of us are so busy, it is imperative that we eat right to stay healthy and energetic. Well, my littles always seem to be energetic but the rest of us definitely need the right fuel! One of my easy go-to meals is soup. 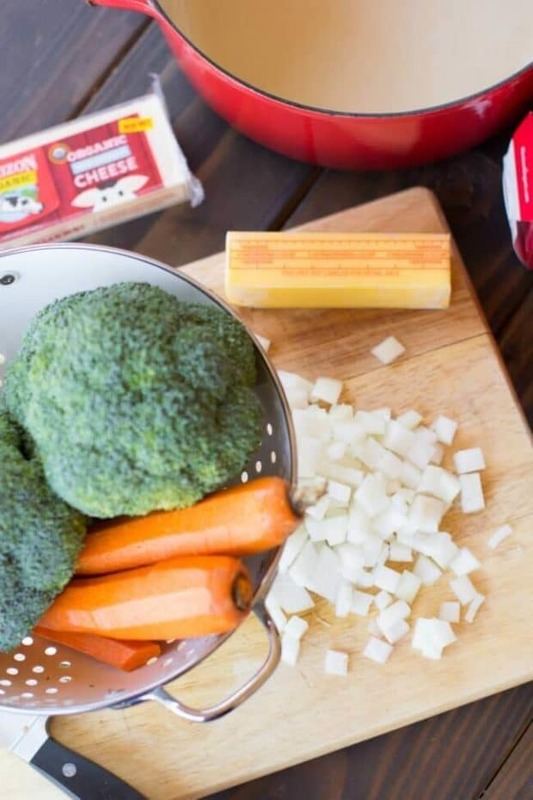 I have always loved broccoli cheddar and fortunately my cheese-loving boys like it, too. This soup is what I call yummy comfort food. It’s rich and full of flavor and I like knowing it’s more than empty calories. 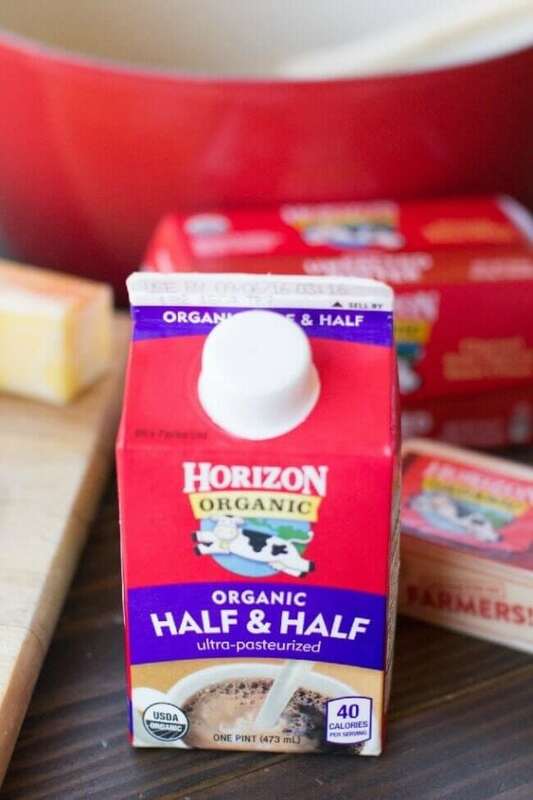 When I find a product that I love and trust, like Horizon, I look for other products in the brand’s line. 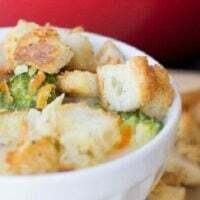 I use the Horizon organics butter, cheddar cheese and half and half in this broccoli cheddar soup for what I call premium taste. 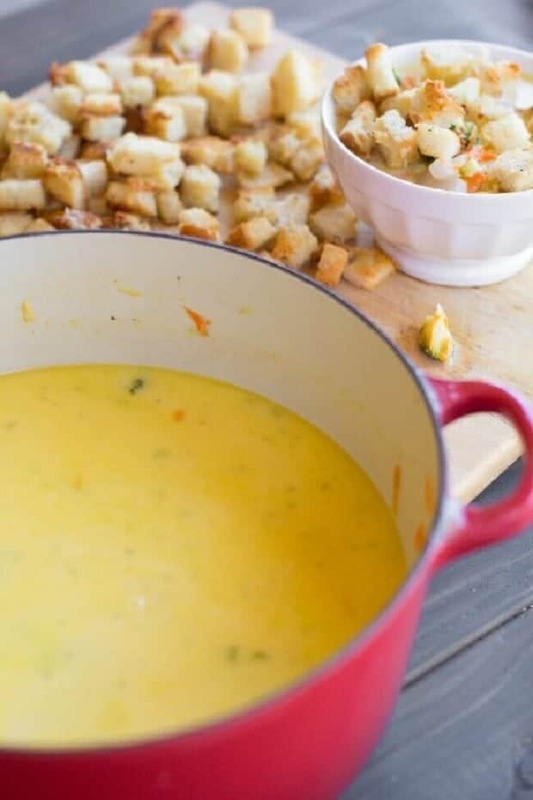 This delicious, simple homemade soup is the perfect family meal. In a large pot, melt butter and add onions, garlic, salt and pepper. Sauté until onions start to sweat and become translucent. Add flour and stir to coat all the onions. (If you want a really thick soup, increase the amount of flour, but no more than ¼ cup). Add white wine and scrape all the bits off the bottom of the pan. Pour in chicken broth and bring to a low simmer. Chop the broccoli into small florets. 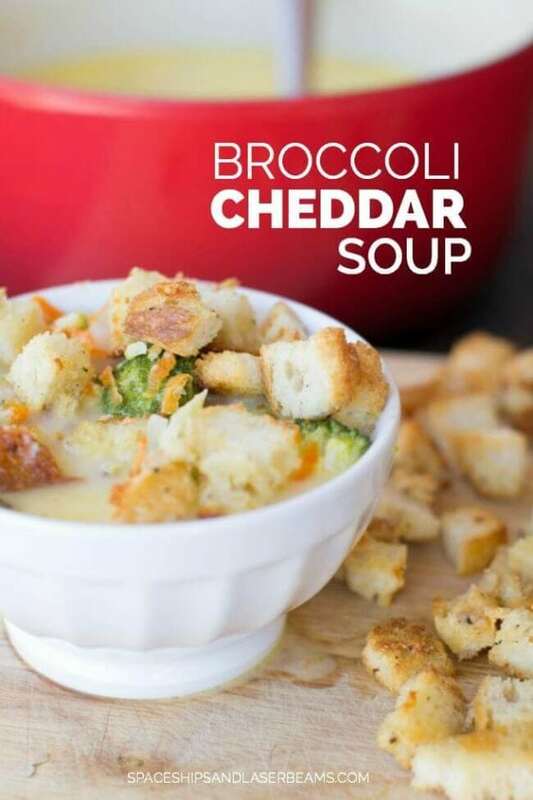 Add broccoli and carrots to the soup. Bring back to a simmer and cook for 3-4 minutes. Turn off heat and stir in half and half and cheese. Stir until melted. 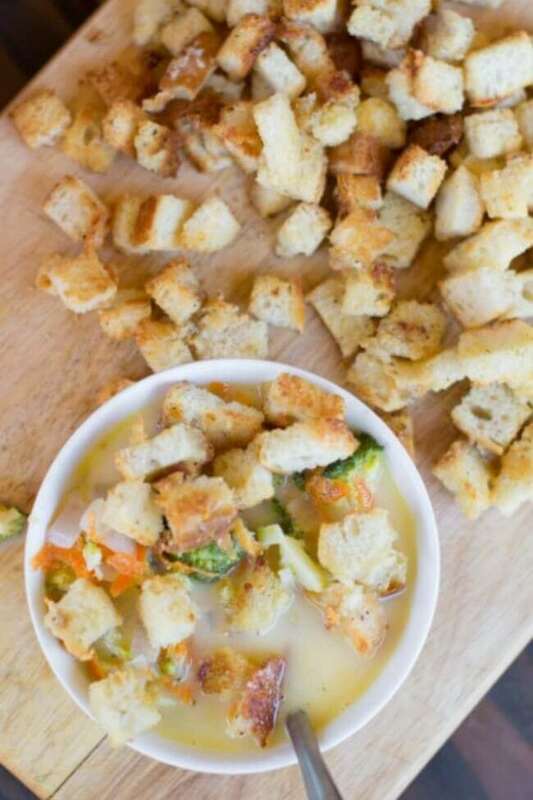 These simple homemade croutons will take any soup or salad to the next level! Cut the bread into small cubes and place on a baking sheet lined with a silicone baking mat or parchment paper. Stir garlic powder into butter and pour over the top of the bread. Sprinkle pepper and cheese on top and toss to coat. Bake at 400 for 5 minutes. 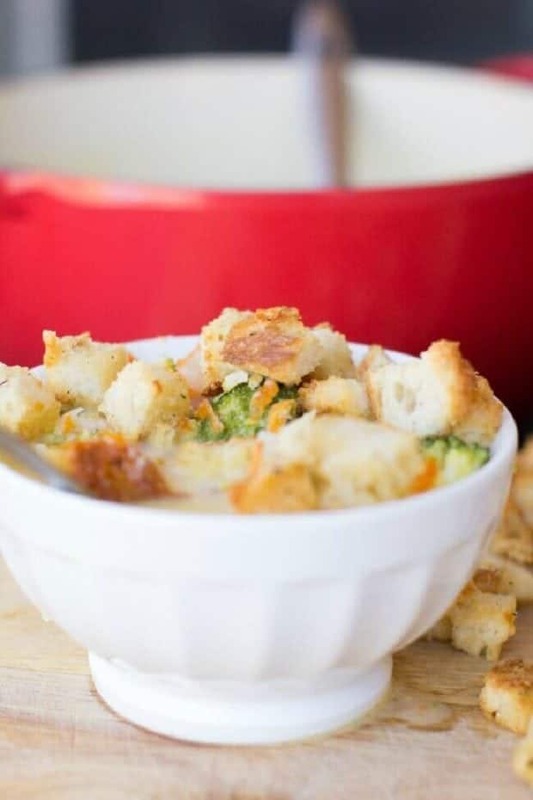 Take pan out of the oven and toss the bread to coat in the melted cheese. Return to oven for another 4-5 minutes until light brown and crispy. Serve on top of soup. One of our family’s favorite meals!